I wasn’t sure how I was going to make my return to Portland poker after my unproductive stint in Las Vegas. I thought about the Thursday night game at the Encore Club, but skipped it, then was too busy early Saturday evening to make starting time for the weekly $10K there. By the time I was free, the first break would have already begun, and there was no way I could make it across town. So the 9pm $200 Freeroll at Portland Players Club it was. Except that when I got there the door was locked and there was a sign saying they were closed for the evening. Yikes! I was on the loose, Encore wouldn’t have a game open for an hour, I was probably too late to make the 8pm at Aces. It just left the dreaded Final Table. So I high-tailed it out Glisan. I got to Final Table just as Level 1 was ending and took a seat at the empty second table. I had to wait a couple of minutes for the first table to be split, and were started off five-handed. Took the first hand I played (at 50/100), from SB with AxTx. There were three players to the flop, the highest card on the board by the turn was a 9, and I bet 100 to win the poison pot, so you know where this story’s going. Fifteen minutes into my game, I got AxJx on BTN and open-raised to 300, getting called by SB. BB went all-in for 3,000. I had him covered by 75 and went all-in, and SB came along. They flipped over KxQx (SB) and AxTx (BB). I had the best hand, but I was statistically a hair behind the KxQx. The flop put out a wheel draw of 2x3x5x , but the turn was a king, sending my hopes into a tailspin. The river brought relief with a 4x, though, and BB and I chopped up the pot, with me getting an extra 75 for my trouble. Five minutes later, on BB with AxJx and I called 550 from UTG1 (same guy who’d been BB in the split). UTG (who’d had the money in the pot when we chopped it) came along again. The flop was 2x3x4x and I mischievously shoved to open. 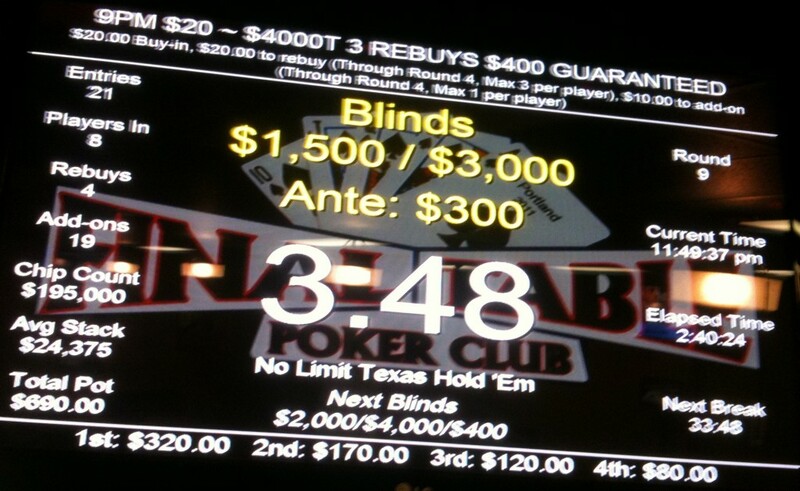 UTG1 called with AxQx but the board double-paired and we split the pot again. Ten minutes later, I wasn’t so lucky. I was all-in UTG1 with AxJx after losing a hand and the same player I’d been tangling with called with KxJx He pulled out a straight on the river and I broke the No Re-buy Rule. I stopped keeping notes after that, wondering if I’d do any better paying more overt attention to what was going on, but it didn’t help. By the break I was down to a half starting stack again, and I lost most of my add-on in a single hand, so I was riding the short stack through to the final table (I did manage to outlast the guy I’d been tangling with). Made a couple of crucial double-ups, but I was still under T10,000 after nearly three hours of play, with blinds at 1,500/3,000/300. I shoved UTG with A♥Q♥ and got a quick call from UTG1, who’d been steadily accumulating chips all evening with sometimes marginal (but lucrative) calls. Her KxTx did it again, making Broadway and putting me out of the first tournament I’d played in ten days. Two hours and twenty minutes (late arrival). Eighth of 21 players. I’m not normally a shootout player, but I was roped into this one and since I’d been knocked out of the tournament twice by hands that I had beat by 3:1 or 2:1, I viewed it as an opportunity to use up some more of that great luck. I never managed to get ahead far in the game, but I ended up just a few dollars down, and managed to qualify for the high hand bonus for the evening when my pocket tens matched up with a rivered ten to make the best full house possible on the board. So, up a little for the evening because of a fluke. Not everyone was there at the start of action. If I remember correctly, both seats on each side of me were open to begin with, while the far end of the table was more or less full. Notice any names that stand out? Let me just point out seat 6, the runner-up in the 2008 WSOP Main Event (to Peter Eastgate) with nearly seven million dollars in lifetime tournament earnings. Seat 4 was no slouch, himself, with more than $1.5 million and at least four WSOP final tables. The guy who’d sit down late on my right had a bracelet. So, some good company to begin with. I began the match in my usual manner, losing ground with Ax7x and AxQx in the first ten minutes. Even T250 lost makes a difference with stacks of T3,000, but the blinds were only 25/25 in the first hour, so still 110 big blinds! Those 11am free rolls with T4,000 and the same blinds to start at Portland Players Club teach you something. I won my first small pot with AxJx after hitting the top pair on the flop from UTG1, then as BB with 6♣7♣ I folded a gutshot. On SB with Kx7x and middle pair on the flop, folded to a bet after Ax on the turn. Twenty minutes in, on BTN and T2,575. Wheee! My UTG just before the half-hour was a crucial hand. AxAx and I min-raised to 50. Lupascu re-raised me to 150. I three-bet to 450 and she four-bet to 900. I shoved, she flipped KxKx and my aces held. She actually had fewer chips than I did, and I performed the first knockout from the table. Easy to win with aces. On BTN six minutes later with K♦J♦ and there were four to the flop after a raise to 50. I made top two, bet 125, and won. UTG on the next round with J♦Jx, I raised to 75. BB called. The flop was queen-high with two hearts. Another heart on the turn. I called a bet of 250 on the river and beat ace high. 45 minutes in to the tournament and I had T5,625, which doesn’t sound like much, but it’s closing in on twice starting stack. SB 6♠7♠ and I called 75 in a three-way hand. The flop had two spades, I bet 150 and took it down. T5,775 on CO.
Lost my first showdown with K♠2♠ as CO. I flopped straight and flush draws and raised to 175, then called 350. The turn was a blank and Tx on the river made a full house for JxTx. I ended the first hour as HJ with T5,375. UTG2 and AxJx. Blinds were 25/50. I raised to 125, BB re-raised to 400. short-stacked UTG called, I called, and the flop was Q♠8♠8x. UTG bet 700 and BB and I folded. UTG and I was down to T4650. Picking up 7♣2♣ wasn’t going to do me any good. A♥T♦ in CO and I called a raise to 100 in a 5-way hand. The flop was T♥9♦6♥. I bet 300, BB raised to 700. UTG went all-in and I folded. KxTx won with top pair v 8♥9♥. I was free-falling and hit HJ with T4,075. Just before the end of the second hour, I screwed up playing 3x4x and dropped to T3,600. Then, just before the break on BTN, I called a SB raise to 425 with AxJx and whiffed the fold, leaving me with just T3,125. Coming back, with TxTx in HJ, I called 450, then folded on a king-high flop and all-in. Called 100 with KxTx to see the flop with two other players and bet 235 on a AxTx5x flop. We both checked the Qx turn. The river was 2x, BB bet 400 and I called; he had me beat from the get-go with Ax2x. Down to T1,925 UTG after two and three-quarters hours. Put my last small-denomination chips into the pot as BTN playing Q♦5♦ hoping to catch something, but was down to T1,500 as CO. I shoved over a raise of 260 with KxJx from HJ and took a pot, finally, getting to T1,900 UTG4, but it was only a few minutes into the third hour when I got involved in a 3-way shovefest with 2x2x against 7x7x and AxAx and was knocked out. My last hand of the 2012 WSOP (maybe my last hand of any WSOP) went pretty much the way of the rest of my time here in Las Vegas the past couple weeks. I was in the third level of the 2pm Deepstack tournament. They’ve been huge, but today’s was particularly large; we’re near the Main Event, the final table of the One Million for One Drop benefit was playing out, and there weren’t any smaller buy-in bracelet events starting today, just a $10,000 6-Handed NLHE event and a $3,000 PLO8, both of which sound like a lot of fun but which are a little out of the range of most players. So the field in the Deepstack was 1,711 today, with a prize pool of $333,645, 198 places paid, and a top prizer on the schedule of $61,796 (I was on a table with a guy the other night who said he was in a 16-way chop at the end of one of them last weekend, with each player taking home over $10,000 on a $235 investment). Overflow from the Derepstack led to tables being set up in hallways a few hundred feet from the tournament area, practically up at the registration area of the Rio. I’ve been up and a little down in the tournament. Currently, I was down to between 10,000 and 11,000 chips, with blinds at just 100/200, so I have 50 big blinds. Our table has just four of its original players remaining (including myself). There are three New York/New Jersey guys in seats 1, 3, and 4. There’s a woman in seat 2. All are what I think of as “older” but they’re probably only ten or fifteen years older than me. All of them seem to be pretty competent and have won good-sized pots. The guy in seat 1 just won an enormous pot that took out three players a few minutes earlier. I’m in seat 6. Seat 5 is a South American guy who sat down for his first hand, made a raise UTG, then folded it after four all-ins, which is what led to the three open seats. Seats 7 and 9 are occupied by a couple of younger European guys who showed up after the all-ins. Seat 7 has proven aggresive and already managed to lose some chips to Seat 1 after winning a pot or two. Anyway, the button is on me, and I pick up K♣K♠. The blinds are on the Euroguys (I saw the funniest Euroguy at the Venetian the other day: he had sort of shaved-side head with a peroxide mop thing on top, and a white ski jacket with a neck that made him look like he was wearing a brace or some sort of medieval gorget). Seat 1 raises to 450 and gets 2 callers, I don’t remember who, exactly. I re-raise to 2,100 with my kings. The blinds are out. 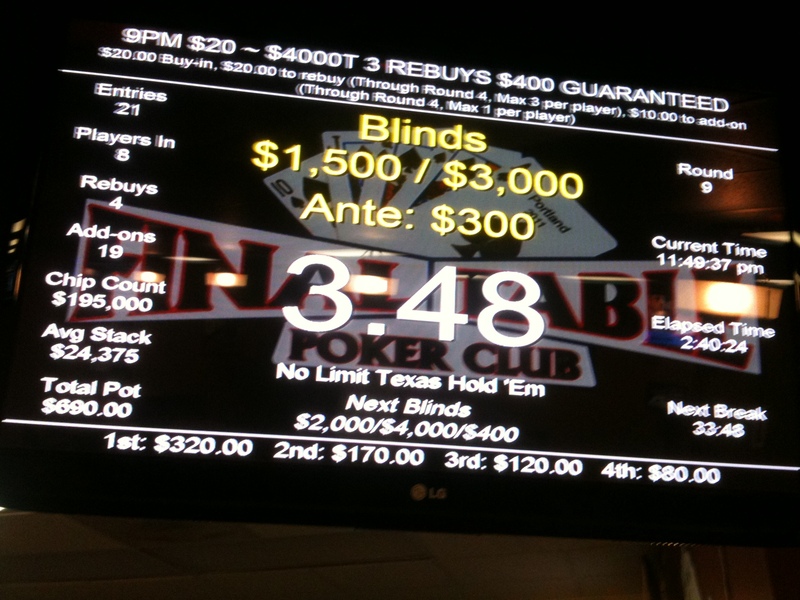 Seat 1 three-bets to 4,500 and the other callers go away. I’m pretty certain at this point that I’m up against aces. It’s going to cost me just less than half my stack to see if I can hit a set on the flop and make life difficult for him. There’s 7,800 in the pot, I need to call 2,400. 3.25:1. I can recover from 6,500. The flop puts out three spades, none of them the ace, none of them face cards. Seat 1 goes all-in and, having just taken out three players plus other winnings, he’s got me well-covered. There’s now 16,700 in the pot. 2.5:1 to call. If he’s got aces—and I’m pretty sure he does—there’s a 50% chance that he doesn’t have A♠. If he doesn’t, I’m still behind, but have a lot of outs to make my flush; even A♠ would be dead to him unless the board paired. If he does have A♠, then I’m drawing incredibly thin, hoping for K♥ or K♦ and no more spades. Is he bluffing me? Or is he sucking me in? Sucking in, as it turned out. He had me beat before the fourth (and fifth) spade turned over on the board. No straight flush, unfortunately.